Your act as a fighter for independence of the Republic of Indonesia to fight against the Dutch and japanese colonizers. No one option is that you expect other than free or die! 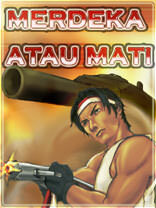 This game begins with some level of action and exciting challenges supported with sound effects and feel of a war with the music soundtrack theme songs national struggle, and ended with a level berkibarnya closed with the red white flag. Merdeka!